Summary : I liked this tea. The tea had a pleasant yet subtle taste to it. Yet it was quite flavorful. The taste is hard to describe...best way to say it is that it tastes like a white tea! Review : I'm new to drinking white teas. So new...in fact...that this is my second white tea! As such, I don't have a "frame of reference" available to compare this tea to anything else really. So you may wish to take this review with a "little grain of salt." White tea, for those not familiar with it, is considered the "premium of teas" in the tea world. 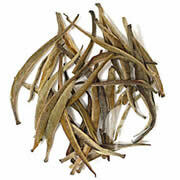 White tea comes from a special tea plant variety, called Narcissus, of which only select leaves are used. Because of this, white teas tend to be the most expensive of teas available. This is how Adagio Teas describes their White Assam Tea on their website : "Comprised solely of the tender unopened buds gathered in the second flush of early summer, this is an outstanding tea that fuses the gentle sweetness of white with a subtle malty taste, a characteristic of all Assam teas. A delicacy for every occasion." And you know what, after reading Adagio's description of this tea, I would have to agree. This tea does have a light, malty taste to it. And there is no question that the tea is subtle. Yet...at the same time...it does have a pleasant and moderately strong flavor to it. Straight out of the tin that the tea arrives in you most likely won't be impressed, at least not by the teas fragrance. On the other hand, one can not help but be impressed by the size of the leaves. They are huge...and only get larger during the brewing process. The final product once brewed has a light orange color to it, and is rather pleasing to look at I thought. And the taste, while far from overpowering, is definitely of moderate strength. And more importantly, it is a good taste. You won't find any bitterness here. Recommendation : Yes. While it is not my favorite white tea (I liked the White Pear Tea better), this is certainly a tasty and pleasant tea. The tea is also probably a good tea for people new to white tea to experiment with, too.